Crimp Seals (caps) for Sealing Crimp-Neck Glass Vials. Various colours and styles: Flip off, Tear off, Flip up Seals. Visit &amp; view our full range. Flip Off Seals / Caps: Crimp on caps for injection vials. An aluminium flip off crimp seal with plastic top which flips off tearing out the centre revealing the septa or stopper, commonly used for injection vials. Complete Tear Off Seals / Caps: Crimp on tear off seals usually one piece aluminium allowing complete removal by hand for full access to the contents of the vial. Centre Tear Out Seals / Caps: Plain one piece crimp on aluminium seal with centre section that can be removed to gain access to the stopper; for injection. Flip Off Tear Off Caps / Seals: Tamper evident crimp seal with plastic top which allows complete tear off of the aluminium seal by hand. The aluminium seal remains attached to the plastic top and allows the complete removal of the aluminium part; for aluminium crimp sealed serum vial. 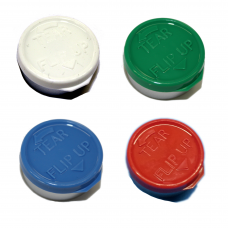 Flip Up Tear Off Seals / Caps: Similar to the crimp on flip-off tear-off seals but with a tag on the side of the plastic cap indicating position and direction of removal. Crimp on Closure/Cap (3 piece) with top and Seal: Closure / dispenser for use on aromatherapy bottles, aftershave lotion containers and creams. These crimp seals with screw tops can be manufactured to the customers design preference in aluminium with coloured anodising if required. MOQ applies. Vial Stoppers: Round Bottom injection stoppers, 2-Leg or multi leg lyophilisation Stoppers (Or bungs) available in Grey Butyl Rubber, Silicone Treated Butyl Rubber & Clear Silicone. Colours: Natural, Blue, red, grey, green, yellow, black, white, pink, orange and purple and more. The seals can be customized with your logo when ordered in large quantities, please ask. 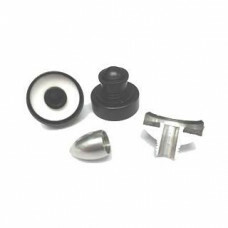 We can supply all your crimp cap / seals and vial stopper requirements. 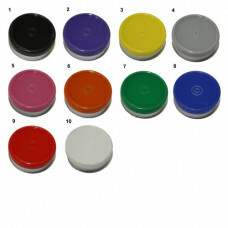 Simply select your required cap / seal type below to view our range. Flip Off Caps come pre-assembled, ready to crimp on injection vials using the required crimper. 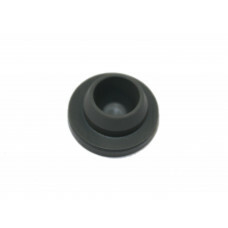 ..
We can supply you with Complete Tear Off Caps / Seals in 13mm, 20mm and 30mm sizes. 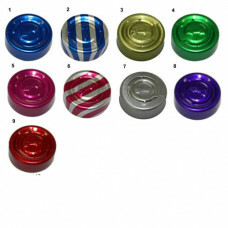 Our Complete Tea..
Centre Tear Out Caps / Seals in 13mm, 20mm and 32mm sizes.Our centre tear out caps are designed so t..
*Available only in 20mm.The plastic cap on these Tear Flip-Up Seals, lifts up using your fingertip..
Aromatherapy Cap / DispensersThese machine turned crimp on caps / closures can be produced in a vari.. 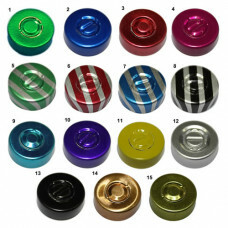 This is a very small sample of available vial stoppers we can supply.Vial Stoppers can be supplied i..